Betsua isn’t used to being noticed. Her Talent is a little wild sometimes and just lately, her telekinesis has been ranging off the charts. She doesn’t want anyone to know, but Agnor notices and asks her to join his crew. She jumps at the chance to get away from home, but Agnor has more in mind than merely helping her with her wayward Talent. The new StarLord sees something in Betsua that attracts him in ways he has never experienced before. On a desperate mission to discover how the enemy collective holds the minds of so many people enslaved, will Ag and Bet be able to keep their minds on business and their hands off each other long enough to learn the secret of the blue crystals? Can love restore a broken woman’s faith in humanity? Darak has just been elevated in rank and given new responsibilities, but his devil-may-care style belies a gentle soul. He feels deeply and his empathic abilities sometimes make him care too much. How then, can he ignore the shattered soul that cries out to him from a woman who, until recently, was his enemy? Jana was kidnapped and forced to do many things she cannot remember, but feels deep shame for, nonetheless. Reunited with her sister and taken to the dubious safety of the seat of Council power to heal, she has no idea what’s in store for the future. She only knows she’s free for the first time in years. Free to think on her own. Free to talk to her sister. Free to admire the maddening man who bothers her on every level. Can Darak’s healing touch break through the fragile facade Jana shows to the world? And when her help is needed to penetrate deep into the enemy stronghold, will she help, or will she show her true colors? The fate of the galaxy might just be in their hands…as well as the fate of two hearts looking for their perfect match. On a remote space station near the galactic rim, a retired soldier-turned-mercenary must make a decision that will alter the course of two galaxies and billions of lives. Guided by a gorgeous woman with a mysterious gift, will he make the right choice not only for himself, but for the woman who is quickly becoming more important to him than life itself? And will his decision condemn two races to everlasting war, or offer a glimmer of hope in the ongoing intergalactic conflict? Is she an apparition or is she real? Crash landing on an uncharted planet, Ezekiel Amber sets out across a desert, looking for help. What he finds is salvation in the form of a woman. Angela finds the handsome, unconscious man and takes him below ground, where the heat of the desert does not reach. She nurses him back to health, trying hard to ignore the attraction between them. 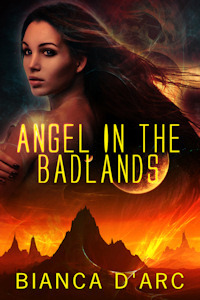 Angel’s small community must be protected from humanity’s alien enemies. 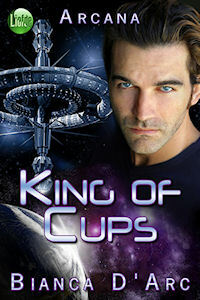 Likewise, Zeke must protect Angela – his angel – the one woman he wants like no other in the universe. It’s a race to see who will get there first – Zeke’s reinforcements or the aliens – and the fate of the human race could hang in the balance. A Jit’Suku Chronicles short story. Enemy Captain Fedroval – Val for short – shoots down a one-man fighter out near the Galactic Rim, but the pilot, much to his surprise and horror, is a human woman named Lisbet Duncan. The alien warriors have a strict code. In their culture, making war on females is a shameful stain on one’s honor. The captain doesn’t quite know what to do with Lisbet, but he can’t let her die alone in space. He orders his men to tow her life pod into their battle ship. Val is the last of his line – heir to a doomed legacy – because no respectable jit’suku woman will have him after the destruction of his family. He has put all his considerable resources into building his state-of-the-art battleship and joining the fight to take the human galaxy, hoping to restore his honor in some small way. This is Val’s first foray into human space and his first encounter with a human female. He finds her strangely alluring and altogether irresistible. Lisbet is attracted to Val as well. When he puts the moves on her, she can’t resist his masculine charm, but she doesn’t like being a prisoner – even if she is being kept in a gilded cage, treated more like a guest. She doesn’t know a lot about jit’suku culture and it’s pretty clear they don’t understand much about humans. It’s going to be fun educating her captor about just how headstrong, fierce… and loving… a human woman can be. Spymaster Chip is the King of Clubs – a professional bar manager and soldier – sent to run intel operatives out of a bar on Madhatter Station out near the Galactic Rim. Lila has been managing the bar in her sister’s absence for two weeks when, as she predicted using her deck of cards and her clairvoyant gift, Chip arrives. Sparks fly between them almost immediately, only spiking higher when they uncover a plot to take over the station. Can the new lovers and a handful of retired vets avert catastrophe and save the station? Chip didn’t expect to find the bar open for business when he arrived at The Rabbit Hole on Madhatter Station. Not only is it open, but a beautiful woman is running the joint. He’s instantly attracted to her, but tragedy in his past has kept him from getting involved in any but the most superficial of relationships. This woman, though, she tempts him like no other. Lila foresaw the coming of her own personal Charlemagne, the King of Clubs. She had no idea he would be so appealing though. A widow, Lila didn’t expect to be so attracted to the ex-soldier. 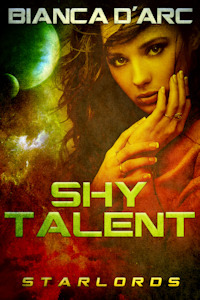 Her female senses stir to life for the first time in years and she wants to get to know him better. A lot better. When pirates plot to take control of Madhatter Station, it’s up to Chip and Lila to organize the resistance. With a handful of well placed vets and a handful of pilots, they mount a defense, but will it be enough? Or will it be too little, too late? And what of the lovers? Will their love and belief in each other be enough to see them through one of the greatest tests of the human mind? Alexander is the proprietor of a working class bar called The Rabbit Hole. One of its best features, in his opinion is the petite woman who deals cards and sometimes foresees the future. Della is an undercover operative working for the same intelligence service as Alexander, though he’s only just come to realize it. She follows her visions of the future, with her employers’ encouragement, to put her in the right places at the right times to do good for the human race. Lately, the right place has been in Alex’s bar and the right time is quickly approaching. It’ll be a turning point, both for her personally and for the warring races of humanity and jit’suku. When the heir to the jit’suku empire is attacked, Della and Alex race to save him. Taken aboard the alien ship, Della and Alex must deal with a series of unforeseen events which put their lives and millions of humans and jit’suku in dire jeopardy. Can they find solutions for not only their people, but for themselves and the forbidden love they discover between them?